Lacrosse is rapidly growing in popularity across the nation and Idaho is no different. In order to keep up with the nearly constant growth, especially at the youth levels, the ILOA offers free training opportunities to any individual who might be interested in officiating the great sport of lacrosse. 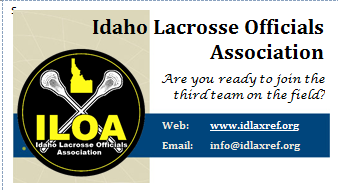 If you have any questions please get in contact with us at info@idlaxref.org.